PHUKET: The concrete blocks that will block lanes in front Central Festival Phuket so that work can commence on Phuket’s first underpass will be put in place tonight, the contractor’s project manager confirmed to the Phuket Gazette today. “At about 10pm, we will start by installing the barriers to close off the lanes we will be working on,” explained project manager Narong Horee of contractor Italian-Thai Development Co Ltd.
“Tomorrow, we will start cutting down the tress along the road and the following day we will have machinery on site to start digging up the road surface,” he added. 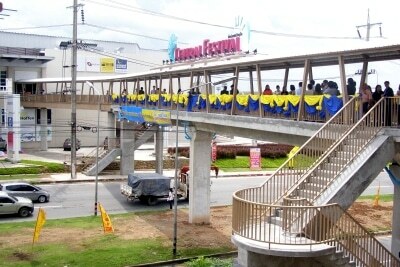 Phuket Highways Office Director Samak Luedwonghad said that in order to clear the area for construction, the pedestrian bridge that connects Central Festival Phuket to the HomeWorks complex will be knocked down. Road users this morning reported no unusual delays around the junction with most having no difficulty in getting to work as normal. “I drove through the junction on my way to Central Festival at about 9:30am and I didn’t see any signs of construction – just the sign on the median strip saying ‘construction ahead’,” said Venus Phunchang, Central Festival’s Public Relations officer. Premalin Khampee, the Tourist Department Manager at Central Festival Phuket, shared a similar experience. “I heard that today will be the first day of the underpass project [construction], but this morning the traffic was flowing well. It just didn’t feel like a big construction project was about to start,” she told the Gazette. With the imminent loss of the pedestrian bridge joining the two popular shopping complexes, Ms Premalin was able to provide a ‘solution’ for those who park their cars on the HomeWorks side of the bypass road. “We will be providing a shuttle bus service that will bring customers from the HomeWorks mall to Central Festival Phuket. 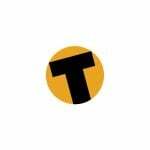 “We are also trying to acquire more parking space at the Thainaan Restaurant across the road. We have contacted the restaurant to ask for their permission, but we have yet to receive a reply,” she added.